Ikeda’s quality ryokucha proves that not all powdered green tea is the same. The taste of a powdered ryokucha and the effects it has on the body are strongly influenced by the quality of the tea leaves used in its making. The blend introduced this month, Ikeda’s Satsuma Yabukita Funmatsu Ryokucha, comes from the famed Chiran tea growing region of Kagoshima prefecture and is made from top quality grade sencha leaves. 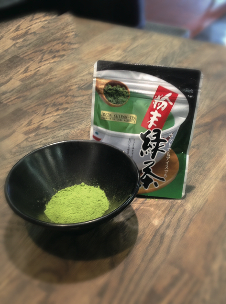 It easily sweeps away any preconceptions people may have had about powdered ryokucha having a cheap and unappealing flavour, and lets you enjoy a delicious cup of green tea with a fresh, vibrant colour and deep flavour. A great cup can be made from a surprisingly small amount of powder, and it even dissolves in both hot and cold water. The aroma rivals that of high quality macchas, and in recent years it has enjoyed popularity through many different uses, such as an ingredient in snacks like sencha biscuits, or as a mixer for alcoholic drinks. Powdering the sencha leaves retains all their nutrients, making this tea very good for the drinker’s health, and it even protects against intestinal cancer.